Choosing Top Shelf Maintenance means that your individual needs will be met with the same care and attention to detail as we give to our personal aquariums. 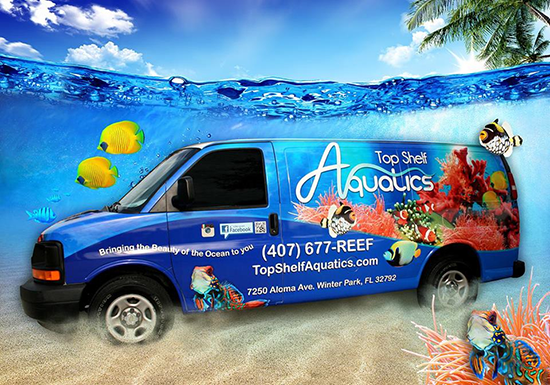 We will make appropriate recommendations and take care of all your aquarium needs. With over 40 years of combined saltwater experience amongst our staff, you can be sure to receive the absolute best service and knowledge available. We are a fully licensed and insured saltwater aquarium store. We provide aquarium maintenance and aquarium installations for both residential and commercial applications. We service: Winter Park – Orlando, Maitland – Casselberry, Dr. Phillips – Windermere, Winter Springs – Islesworth, Winter Garden – Downtown Orlando, Thornton Park – Delaney Park, Waterford lakes – UCF, Avalon park -Baldwin Park, Metrowest – South Orlando, Hunter’s Creek –Oviedo, Sanford – Apopka, Lake Mary – Eustis, Tavares – Leesburg, Mt. Dora – Clermont, Altamonte Springs – West Kissimmee, Orange County – Lake County, Spring Hill & Tampa – New Smyrna Beach. Whatever your needs may be we are happy to travel to you, whether you are in Miami or Jacksonville we are here for you.